This page provides a video archive of presentations at the annual SSEP National Conference by student researchers whose experiments were part of the SSEP Mission 1 to ISS Aquarius experiments payload. Mission 1 to ISS was the third SSEP flight opportunity. Aquarius launched on SpaceX-D1, May 22, 2012, from Cape Canaveral Air Force Station, FL, and returned to Earth on Soyuz (TMA-03M) 29S on July 1, 2012. For details on the flight profile for Aquarius, see the SSEP Mission 1 to the International Space Station (ISS) page. Some student flight teams present at more than one annual conference, reporting out status at various stages of the life cycle of a flight experiment. It is also true that not all student flight teams attend a conference. For details on all Aquarius flight experiments, see the Selected Experiments on SSEP Mission 1 to ISS page. Abstract: To facilitate safe continual human presence in low-earth orbit and humanity’s eventual colonization of space, it is essential to determine the necessary dosage and type of antibiotics necessary to treat an infection. In this investigation, P. aeruginosa was used as a model bacteria to understand the effect of microgravity on antibiotic resistance. By comparing a ground control experiment to a flight experiment, we sought to analyze the factors affecting the bacteria. Abstract: By growing two bacterial cultures of Pseudomonas aeruginosa, we investigate the effects of microgravity on the antibacterial resistance of bacteria. With help from Oaks Crest Institute in Pasadena, CA, we believe that microgravity will play a difference in the resistance to common antibiotics. Based on past studies, a higher resistance is expected. Abstract: The purpose of our experiment is to observe the effect of microgravity on cell division and to compare the rates of cell division in the absence and presence of gravity. We have chosen fibroblasts for this experiment. The cells will be exposed to microgravity as they proliferate; simultaneously, an identical experiment will be held to serve as a control. After the experiment’s completion, we will compare the results with those of the control experiment. Abstract: Students investigated the process of growth in Oyster Mushroom, and uses in microgravity. Studies were conducted to observe mycelium growth on agar plates, placed under the variables found in space (lack of gas exchange, low temperature, etc). Cultures were also placed in rye grain containers to test catabolic action of fungi on organic material, and fruiting discrepancies because of space conditions. Practical use was observed in the fungi’s ability to compete with mold and bacteria. Abstract: The student investigators from the Chaminade College Preparatory and the Medtronic Foundation studied the effects of microgravity on the rate of Carbon Dioxide production during alcoholic fermentation of grape juice. The student team prepared samples that would run concurrently on the International Space Station and in our lab in West Hills, California. The team believes that the grape juice in microgravity will ferment faster producing more carbon dioxide. Abstract: A student team from Avicenna Academy studied the curli-producing capability of E. coli O157:H7 438950R. They designed an experiment to be carried out on the International Space Station that will determine the effect of microgravity on the little hair-like extensions on the outside of the bacteria. These curli are not manifested in each generation, but serve to aid in the bacteria’s ability to produce biofilm which increase the pathogenicity of the organism. Abstract: Our team sent dormant Killifish eggs on the SpaceX Dragon. After settling on the ISS, these eggs will be rehydrated. When results are in, we will be able to tell if the bone and muscle mass of the fish had been affected, being micro-gravity’s pulling force is no where comparable to Earth’s gravity. Another part of this testing, since these fish have kidneys, would be able to tell if, even for such a small species, these animals have kidney stones. This testing will help with the health of humans. Abstract: I am heading a team comprised of scientists from the National Institutes of Health, the University of Nottingham, JAXA, and Tohoku University to investigate the effects of microgravity and increased levels of radiation on a daf-mutated strain of the model organism Caenorhabditis elegans. The mutation extends lifespan up to one hundred per cent on Earth. We will look at lifespan, reproductive strength, muscle defects, genomics, and proteomics for data analysis. Abstract: The Student Spaceflight Experiments Program (SSEP) is a United States national science, technology, engineering, and mathematics initiative that aims to increase student interest in science by offering opportunities to perform spaceflight experiments. The experiment detailed here was selected and flown aboard the third SSEP mission and the first SSEP mission to the International Space Station (ISS). Caenorhabditis elegans is a small, transparent, self-fertilizing hermaphroditic roundworm that is commonly used in biological experi- ments both on Earth and in Low Earth Orbit. Past experiments have found decreased expression of mRNA for several genes whose expression can be controlled by the FOXO transcription factor DAF-16. We flew a daf-16 mutant and control worms to determine if the effects of spaceflight on C. elegans are mediated by DAF-16. The experiment used a Type Two Fluids Mixing Enclosure (FME), developed by Nanoracks LLC, and was delivered to the ISS aboard the SpaceX Dragon and returned aboard the Russian Soyuz. The short time interval between experiment selection and the flight rendered preflight experiment verification tests impossible. 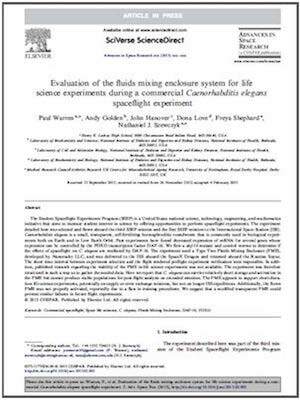 In addi- tion, published research regarding the viability of the FME in life science experiments was not available. The experiment was therefore structured in such a way as to gather the needed data. Here we report that C. elegans can survive relatively short storage and activation in the FME but cannot produce viable populations for post-flight analysis on extended missions. The FME appears to support short-dura- tion life science experiments, potentially on supply or crew exchange missions, but not on longer ISS expeditions. Additionally, the flown FME was not properly activated, reportedly due to a flaw in training procedures. We suggest that a modified transparent FME could prevent similar failures in future flight experiments. Abstract: Opuntia mucilage has been shown to effectively remove chromium and other metals from contaminated water, which makes it useful as a natural flocculating agent. The flocculation process is caused by interaction of the positive metal ions with the anionic polyelectrolyte, the mucilage. Since charged particles easily agglomerate in microgravity, we expect the purification process to work in space. After removal of the mucilage, the chromium content of the remaining solution is measured with a spectrophotometer.